Strap, Mohave. Colorado River Reservation, Arizona. 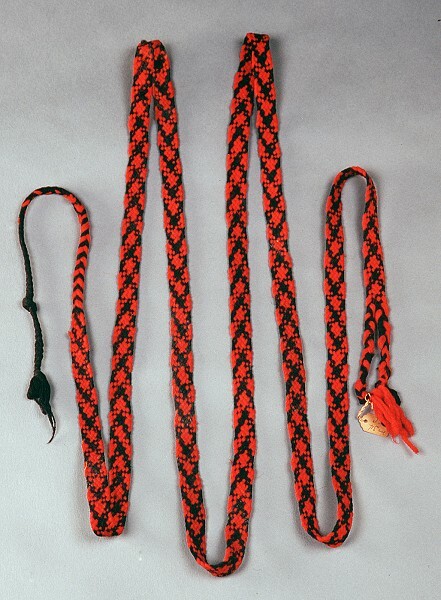 Collected by Alex Hrdlicka in 1908. Department of Anthropology, National Museum of Natural History, Smithsonian Institution, cat. no. E253078, acc. no. 00049349. Dimensions: 114 in. x 5/8 in. 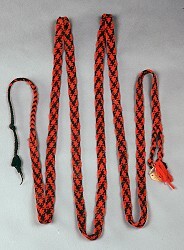 Technique: Interlaced with a tassel at one end and two tassels at the other end. Fibers: 4-ply commercial wool yarn, red and black, S-twist, Z-spin. Design: Repeating diamonds in black on a red background.